"Lord Ganesha is Nada Brahman, Lord of music. He is the repository of knowledge and a mine of virtues from whom emanates illimitable erudition, and cosmic music and rhythm." Thus is the artist's description of this superb release, our first release by Lucette Bourdin, and one of what we hope will be many in the future. 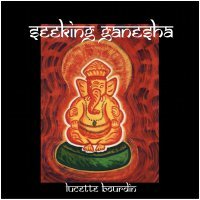 Entitled Seeking Ganesha, this is a tremendous collection of exotic ambient pieces, all performed by visual and musical artist Lucette Bourdin, and all simply wonderful pieces of ambient artistry. The music is at times deeply spiritual in nature and yet is also very open and inviting for meditation, quiet contemplation, or straight forward casual listening. All in all, this is one of Lucette's best releases, and we at Earth Mantra are very excited to bring this to you. Enjoy!